Last week I was in the New 49er office when a fella came in with a gold pan and sniffer bottle in his hand. He introduced himself as Paul Richie. Looking at his bottle, I made the comment, “it sure looks heavy,” and laughed. He smiled at me and dumped the contents of the bottle into the pan. The surprise caused my heart to skip at least one beat. My first thought was he must have brought the gold from Alaska. There were a bunch of nuggets there. One weighed just under three pennyweights. It was really nice gold! After some conversation, John Rose and I followed Paul to his mining site to get a look. The location was only about a mile from the New 49er office in Happy Camp. 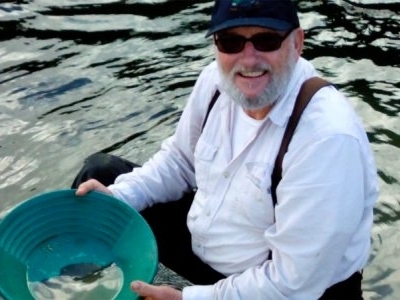 Paul explained that it was another New 49’er member who introduced him the proven location. This is one of the many benefits of New 49’er membership; experienced members always seem ready to help others get into the gold! The interesting thing about this is that Paul just started digging in a hole that someone else had started and left before reaching the pay layer. 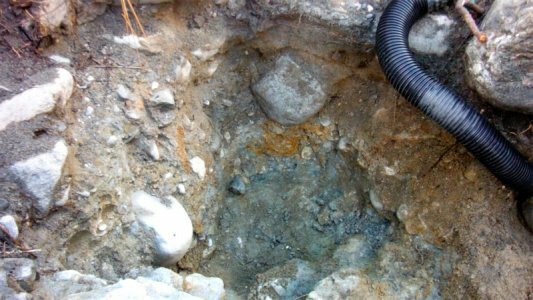 Paul dug a hole about the size of a 5-gallon bucket where he found bedrock. He vacuumed up the area; and after panning it out, he had just fewer than ten pennyweights of beautiful gold. One nugget was just under three pennyweights. The next morning, John Rose and I went to Paul’s site to capture the action on video. Paul explained to us how he chose this spot and the steps he took. As he was vacking, we watched Paul reach down by the hose and picked up a nugget right off the bedrock. 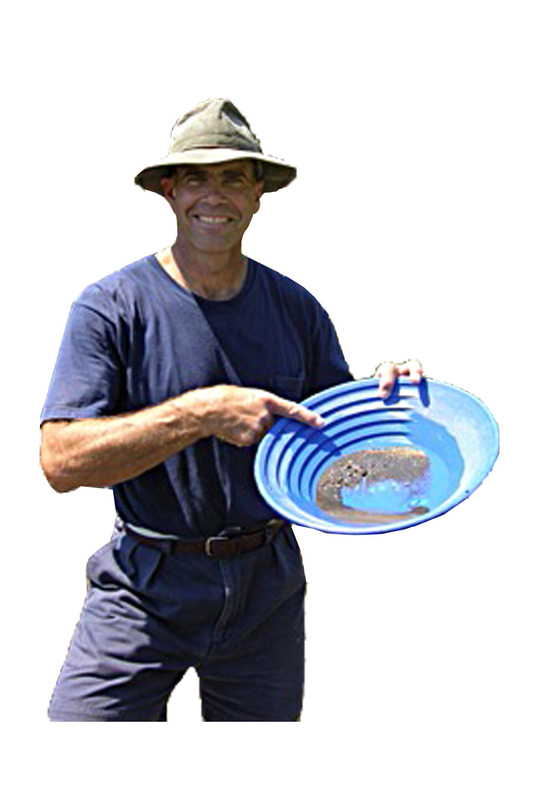 Then he put the contents of the vack into a single gold pan and went down to the river and panned out about a dozen nuggets. 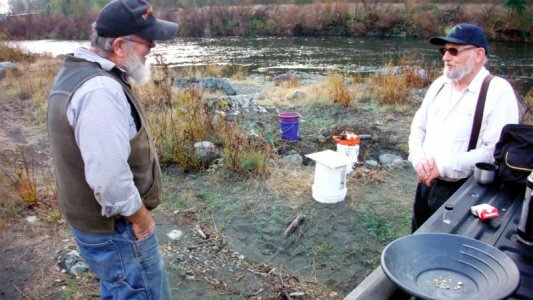 This gold is coming out of some kind of very old hard-packed material that the old-timers must have overlooked, right alongside the Klamath River. Both John and I were astounded by how rich the discovery is! 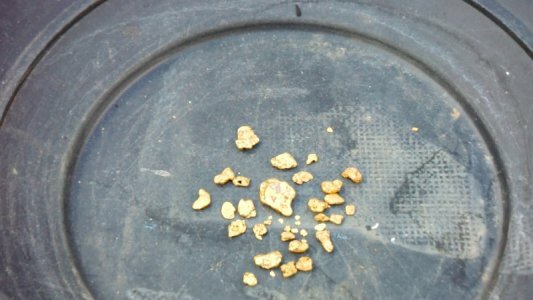 Paul was only in Happy Camp two days and left with enough beautiful gold to make any prospector sweat with envy. We could tell that he was feeling really good. I’ll bet thousands of people have walked right across this place never knowing what lie just underneath! 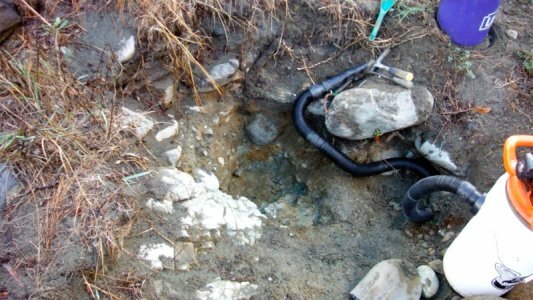 The people who started that hole were only the size of a five-gallon bucket away from a very rich gold discovery. It just goes to show how close you can be to a rich discovery and have no idea that it is present. 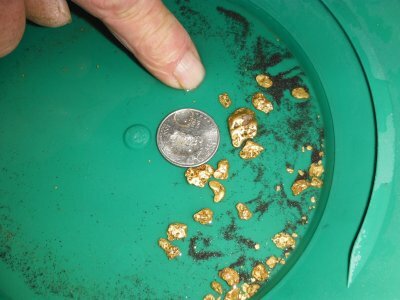 One ounce of gold nuggets: Dennis Costello from Sonora CA. Quarter-ounce of gold nuggets: Bob Burdett from Shingletown CA; William Moore from LaPorte CO; Clifford G Williams from El Cajon CA; Robert Williams from Georgetown CA. Tenth-ounce American Gold Eagles: Donna Craig from Cedaridge, CO; Ernest Nelson from Imperial CA; Frank Madsen from Novato CA; Dan Baker from Springfield MO; Robert Franklin from Cheyenne OK; Shasta Miners and Prospectors Association from Anderson CA; Kevin Dahlke from Springfield VA; Keith Benton from Rescue CA; Raymond O’Hagan from Orting WA; George Kramer from Waxahachie TX. One-once Silver Eagles: Terry White from Cave Junction OR; Michael Krzyszton from Tucson AZ; Duane Werth from Elgin IL; Joseph Loyd from Oroville CA; Don Dahl from Nampa ID; Michael Kuzio from Atascadero CA; Gary Wright from Happy Camp CA; Bill Kerr from Klamath Falls OR; Edward Murphy from Phoenix AZ; Dan Kunz from Wilton CA. Thank you so much to all of you who are actively supporting The New 49ers Legal Fund’s efforts on behalf of small-scale miners! Congratulations to all the winners! Any contributions received after the time of this drawing will generate tickets for the next Legal Fund Drawing – which will be for 3 ounces of American Gold Eagles and 10 ounces of American Silver Eagles. The drawing will take place at the close of business at New 49’er headquarters in Happy Camp, California on 26 February. You do not need to be a member of our organization to participate. You are welcome to be at the drawing, but you do not need to be present to win. Our office will automatically generate a ticket in your name for every $10 legal contribution we receive ($100 will generate 10 tickets). There is no limit to the size or frequency of your contributions, or to the number of prizes you can win. All contributions to The New 49’ers Legal Fund are tax deductible. Once again; thank you guys very much for standing with us! The Rinehart case is waiting for a Decision by the California Supreme Court. You may recall that the California Third Appellate Court found unanimously for suction dredgers in Rinehart. Several large-scale conservative natural resource advocate associations have supported our arguments to the California Supreme Court. At the same time, several prominent anti-resource development organizations and individuals have weighed in against small-scale mining. Now we will just have to wait until the California Supreme Court weighs in. My sources tell me that the California Supreme Court bases its rulings mostly upon U.S. Supreme Court controlling Decisions. If this is true, we are likely to win. From that, we should be able to roll back the State’s determination to impose unreasonable overregulation upon suction gold dredgers. Stay tuned! And in a more recent, surprising development, the State has attempted to criminally prosecute New 49’er members, Derek Eimer and Dyton Gilliland in Siskiyou Superior Court (suction dredging in California without a permit). As many of you know, the State’s position of insisting that suction dredgers obtain a permit which they refuse to make available has already been overruled unanimously by California’s Third Appellate Court and the San Bernardino Superior Court which has taken control of all suction dredging cases in the State. The hearing (Motion to Dismiss) took place just this last week on 5 November. 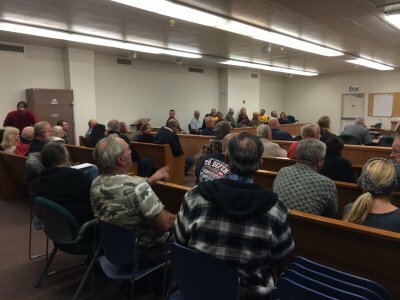 Rather than dismiss the charges, the judge placed a Stay on any further attempted prosecution of suction dredgers in Siskiyou County until the California Supreme Court issues a Ruling in the Rinehart case. 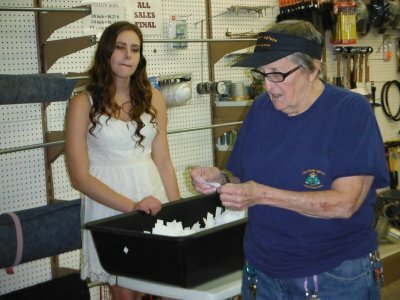 The judge said she would entertain a Motion for a return of all equipment that was seized by Department of Fish & Wildlife wardens. We want to thank each and everyone that was at the courthouse on the 5th. It was great to see such a turn out in support of these two men who are making a stand on behalf of all of us. As prospectors and other supporters filed into the courtroom, the seats filled quickly. Then they started putting people in the jury box. After that there was standing room only. It was a great showing of support for what we believe in. I am sure that the significance of this turnout was not lost on either the court or the state’s attorneys. There is a new Water Quality law which will go into effect next year in California that will affect most of these activities. We are in the process of submitting applications that will cover the extensive properties we make available to our members. All weekend events are free to Full & Associate Members. Schedule of Events: June 4 & 5; June 25 & 26; July 16 & 17; August 6 & 7; August 27 & 28. All of the 2016 events are expected to happen on our A & D #3 Gold Claim at K-23AA . There is plenty of free camping for members on this property, where it is just a walk to where we will be gaining access to the river. There is even more free camping just downstream on our Wingate River Gold Claim at K-23A . There are also private accommodations in Happy Camp, which is only about 12 miles away.